Many eye and vision problems have no obvious signs or symptoms, making a yearly comprehensive eye exam the optimal way to maintain a lifetime of healthy eyes. Primary eye care includes a comprehensive vision and eye health examination. This examination is designed to evaluate the health of the eye and diagnose vision impairments and disease. 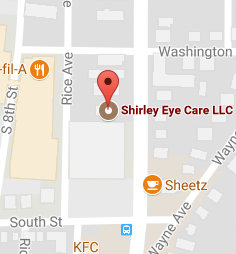 At Shirley Eye Care, a comprehensive exam is comprised of a series of several tests that analyze various functions of the eye. A comprehensive eye exam at our Indiana eye care clinic can identify vision complications during their earliest stages, allowing Dr. Shirley the opportunity to treat them more effectively. The American Optometric Association’s guidelines for receiving comprehensive eye exams begin early in life. The AOA urges parents to bring infants six to twelve months of age to their local optometrist for an exam, and then again at age three and age five before entering kindergarten. Children and adults should receive comprehensive eye exams every one to two years, unless otherwise advised by their optometrist. Say Goodbye to Guessing Between 1 and 2! 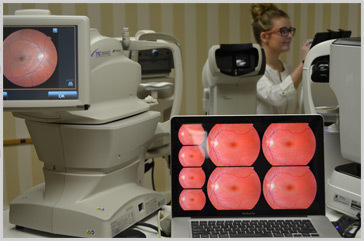 At Shirley Eye Care, our Indiana, PA eye exams are conducted with a digital autorefractor. This takes the guesswork out of your refractive eye exam when you get your prescription assessed. Dr. Shirley utilizes the latest technologies to diagnose and treat patients of all ages. Computerized examination instruments are used to supplement rather than replace personalized care. Examinations include tests for dry eye syndrome, ocular allergies, computer vision syndrome, and the ocular effects of many general health disorders. To provide a better view of the retina, several types of retinal viewing systems are used. This technology provides wide-angle views of the retina to help detect macular degeneration, glaucoma, cataracts, retinal holes or detachments as well as systemic diseases such as diabetes, stroke and high blood pressure. A periodic eye exam can reveal underlying health issues long before other symptoms are present In addition to identifying vision complications and eye disease, a comprehensive eye examination can also reveal conditions like high blood pressure, diabetes, or even a brain tumor. The American Optometric Association recommends that adults under age sixty undergo a comprehensive eye exam at least once every two years. At-risk patients and patients over age sixty should get a comprehensive eye exam from an eye care professional on an annual basis. Yes. Eye examinations can reveal much more than vision impairments – they can save lives. If you haven’t had an eye exam in the past twelve months, contact us to schedule an appointment. Your eye exam with Dr. Shirley will take approximately half an hour and will include a series of tests using advanced optometric machinery. You will also be asked about your medical history and any vision complications you may be experiencing. Eye exams typically do not hurt, but you can expect to look into bright lights or have air blown into your eyes during your visit. What should I expect following my eye appointment? If you are given a clean bill of health with no vision impairments, you can return to your normal activities and plan to visit Shirley Eye Care again in one to two years. If you are found to have refractive errors, you may be given a prescription for eyeglasses or contact lenses. In cases where ocular disease is present, a treatment plan may be implemented, or you may be referred to another medical specialist. American Optometric Association. 2015. Web. .